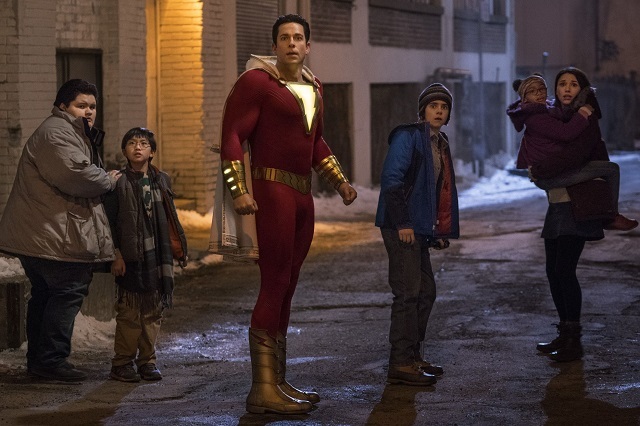 Zachary Levi charms as the kid-turned-superhero in DCEU's most enjoyable film so far. 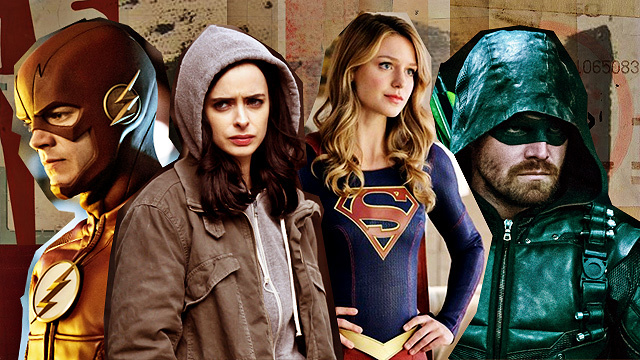 (SPOT.ph) The DC Extended Universe or the DCEU—a collective term for DC’s most recent set of films including Wonder Woman, Aquaman, Justice League, and so on—has had a really rough time trying to build its own universe that would rival the mammoth that Disney-Marvel has created with the Marvel Cinematic Universe. It’s been a roller-coaster road with the gorgeously done Wonder Woman being followed up by the dreadful Justice League, and then rising again with the over-the-top fun of Aquaman. Still, the DCEU can’t quite find its footing, and they’ve decided to branch out more with other DC films not set in the same universe. This decision though came before the explosive arrival of their most enjoyable film yet. Shazam! has all the makings of an awesome comic book-superhero movie. It’s delightful, fun, and exciting, but it’s also touching, hilarious, and genuine. It hits all the right notes to make it the DCEU’s strongest film to date. Shazam! opens in a prologue of sorts, where a boy is transported into this mystical cave where he’s greeted by an aging wizard (Djimon Hounsou) who tests if he is worthy enough. When the boy fails the test, he is cast back into the world and the wizard continues his search for someone who is pure of heart so he can pass on his powers to this chosen one. 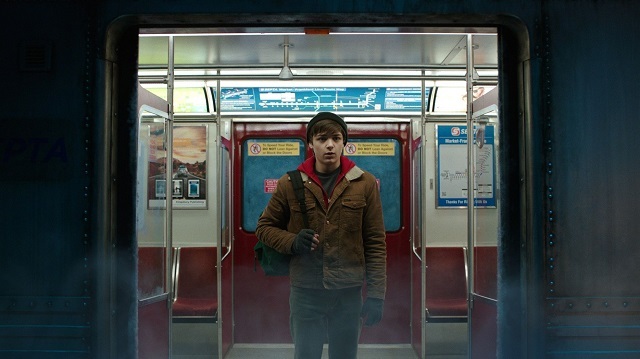 The film then transports to present-day Philadelphia, where the foster-home-jumping Billy Batson (Asher Angel) is searching for his mother who he was separated from years ago. He’s set to move into a group home—one that houses an impossibly delightful set of very diverse kids. Among the kids is Freddy Freeman (Jack Dylan Grazer), a disabled kid who is a superhero nerd that befriends Billy. When some kids bully Freddy, Billy comes to his rescue, and during his escape is transported to the same mystical cave seen at the beginning. 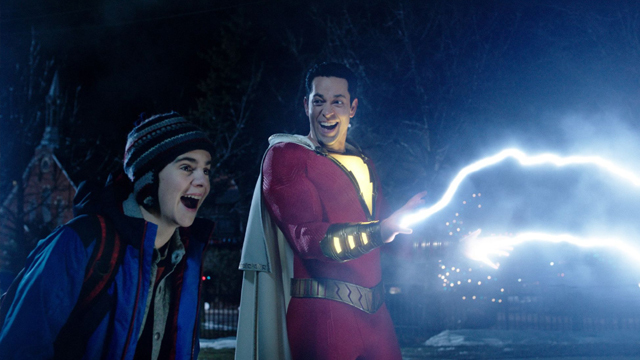 Here, he meets the wizard who believes that Billy is the chosen one, and passes onto him his powers, turning him into the super-powered adult named Shazam (Zachary Levi). 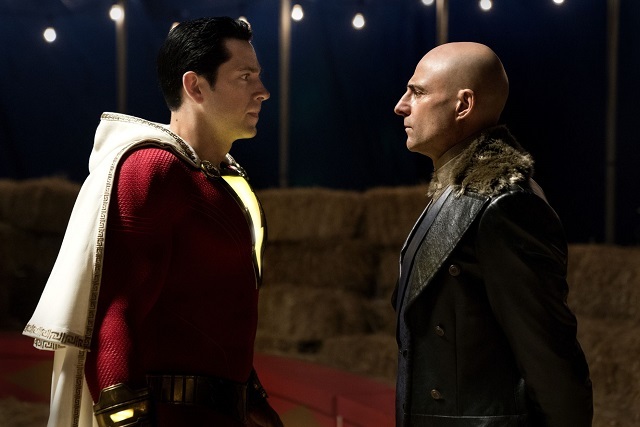 Shazam—now a 14-year-old in a 20-something (maybe even "30-something, at most") man’s body—must learn how to be a superhero and fight evil before a doctor (Mark Strong) unleashes evil onto Earth. There are different films at work in Shazam! but almost surprisingly, director David F. Sandberg and screenwriter Henry Gayden are able to control all the different elements and present them as one cohesive unit. There’s a superhero origin story in here, but there’s also a very touching message about family that plays out like you’re in a family drama, then there’s some horror bits in there when it comes to the villains. Sandberg, director of horror hits Lights Out and Annabelle: Creation seems like an odd fit on paper, but he has come up with something visually hilarious, and a complete energy-filled film. After what James Wan did with Aquaman, maybe the horror directors have come to save the DCEU from itself. Shazam! is by far the lightest DCEU entry, playing like a superhero version of Big (which gets referenced in the film), allowing its characters to have fun, which means the audience has fun. Even its look is bright and sunny, a direct opposite of most other DCEU films that supposedly take place in the same universe. Not once does the film feel like it’s trying too hard to be funny or wacky either. It’s effortlessly funny, and at the same time effortlessly charming, sweet, and heartfelt. Shazam! wears its heart on its ridiculously muscled sleeve, and that makes this film better than its DC predecessors. It hits the viewer whether with its on-point jokes or dramatic flourishes. At times, it does feel like the film is playing too fast, too hard with its pacing but otherwise, it’s the most perfectly structured DCEU film that absolutely lands its third act—one of the most difficult things to do in superhero films nowadays. Zachary Levi has charm to spare as the kid-turned-adult superhero. He goes for it, though at times there seems to be a disconnect from Levi’s Shazam and Asher Angel’s Billy. The two never quite seem like the same person as Levi likes to play way younger than Angel’s 14-year old Billy. They try to explain it off but it doesn’t quite gel. However, what keeps the two together is their amazing chemistry with It breakout Jack Dylan Grazer. Grazer, a scene-stealer in It, is stealing scenes as the chatty Freddy here again, and his chemistry is off the charts with both Angel and Levi. He and Angel are the heart of the film, and they deliver on that front. The rest of the kids in the foster home (Ian Chen, Grace Fulton, and Jovan Armand) are good, but the biggest applause goes to the loving Darla played by the adorable Faithe Herman. She’s delightful, and the character is also just the sweetest thing. Mark Strong also delivers as the terrifying Dr. Sivana, a doctor who has acquired powers that can cause much damage. The cast is wonderful all around, delivering in heart, fear, and comedy. Shazam! 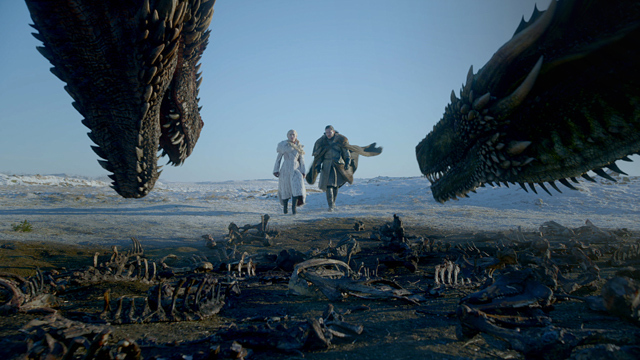 is most definitely a triumph, and it’s the kind of film that would make audiences watch the film again, and then tell their friends how great it is, leading to them watching it again. It’s brilliant, pure fun that always knows where its heart is, delivering a simple but sweet and touching message. 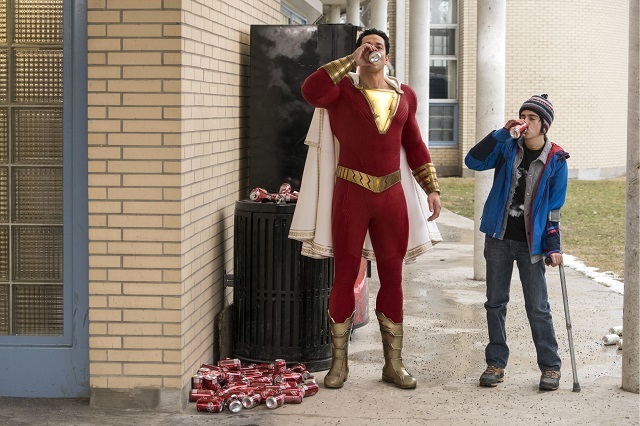 Here and there with its sometimes great, sometimes awful CGI and fake-looking props (Shazam’s staff in particular), it shows that the film doesn’t quite have as huge a budget as Justice League, which is a shame. 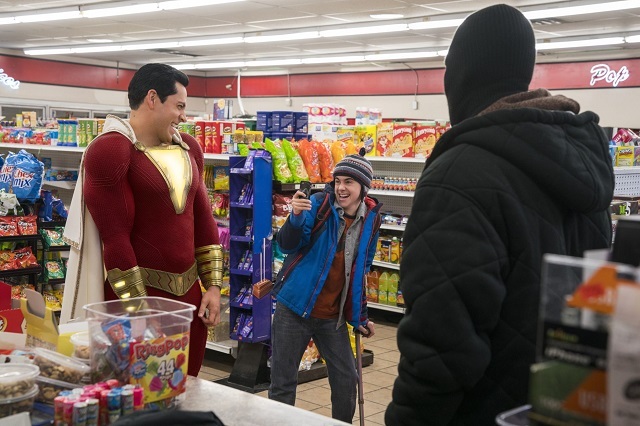 But with so much heart and spirit, Shazam! entertains from beginning to end. This might just be the spark the DCEU needs to keep going. Shazam! opens in theaters on April 3.